Aim: The most common causative agents of urinary tract infections are Esherichia coli and Klebsiella pneumoniae. Increasing numbers of extanded spectrum beta-lactamase producing  isolates led to the search for alternative antibiotics in the treatment of urinary tract infections caused by Esherichia coli and Klebsiella pneumoniae isolates producing extanded spectrum beta-lactamase. This studies aim is to determine the sensitivity of fosfomycin and nitrofurantoin to extanded spectrum beta-lactamase producing Esherichia coli and Klebsiella pneumoniae isolates, which are defined by patients in our hospital, to contribute to the planning of empirical treatment of these patients. Matheryals and Methods: Patients urinary specimens from various services and intensive care unit were evaluated retrospectively. Identification of isolates and antibiotic susceptibility were evaluated with the VITEK 2 ID (bioMérieux, France) automatization system. Results: Extended spectrum β-lactamase producing 85 Esherichia coli and 23 Klebsiella pneumoniae were included in the study. The isolates were identified from the most frequent cases from the intensive care unit (43.5 %). The most sensitive antibiotics are carbapenems. Susceptibility rates to Esherichia coli and Klebsiella pneumoniae isolates were respectively 100% and 87% to carbapenems followed by 98% and 83% to fosfomycin 94% and 30.4% to nitrofurantoin. Conclusions: Fosfomycin is seen as a good alternative agent in urinary tract infections caused by extanded spectrum beta-lactamase producing Esherichia coli and Klebsiella pneumoniae isolates in our hospital for emprical treatment. Amaç: Üriner sistem enfeksiyonlarına en sık neden olan etkenler Esherichia coli ve Klebsiella pneumoniae’dır. Genişlemiş spektrumlu beta laktamaz üreten izolatlarının giderek artıyor olması genişlemiş spektrumlu beta laktamaz üreten E. coli ve Klebsiella pneumoniae izolatlarının neden olduğu üriner sistem enfeksiyonlarının tedavisinde alternatif antibiyotik arayışını doğurmuştur. Bu çalışmanın amacı hastanemizde yatan hastalardan tanımlanan üriner sitem enfeksiyonuna neden olan genişlemiş spektrumlu beta laktamaz üreten Esherichia coli ve Klebsiella pneumoniae izolatlarında fosfomisin ve nitrofurantoine duyarlılığı tespit ederek, bu hastalarda ampirik tedavinin planlanmasına katkıda bulunmaktır. Gereç ve Yöntem: Çeşitli servislerden ve yoğun bakım ünitesinden gönderilen hastalara ait idrar kültürü örnekleri retrospektif olarak değerlendirilmiştir. İzolatların tanımlanması ve antibiyotik duyarlılığının belirlenmesinde VITEK 2 ID (bioMérieux, Fransa) otomatize sistemi kullanılmıştır. Bulgular: İzolatların en sık yoğun bakım ünitesinden (% 43.5) gelen örneklerden tanımlandığı saptanmıştır. İzolatlara karşı en duyarlı antbiyotikler ve duyarlılık oranları Esherichia coli ve Klebsiella pneumoniae için sırasıyla karbapenemlere % 100 ve % 87 ardından fosfomisine % 98 ve % 83, nitrofurantoine % 94 ve % 30.4 tespit edilmiştir. Sonuç: Hastanemizde yatan hastalarda genişlemiş spektrumlu beta laktamaz üreten Esherichia coli ve Klebsiella pneumoniae izolatlarının neden olduğu üriner sistem enfeksiyonlarında fosfomisinin ampirik tedavide iyi bir alternatif bir ajan olarak kullanılabileceği düşünülmüştür. Referans 1. Rané A DR. Urinary Tract Infection: Clinical Perspectives on Urinary Tract Infection Elektronisk resurs, London: Springer London. 2013. Referans 3. Ronald A. The etiology of urinary tract infection: traditional and emerging pathogens. 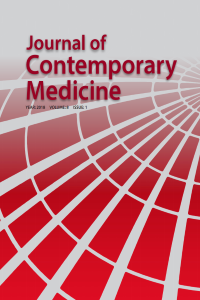 The American journal of medicine. 2002;113 (Suppl 1A):14S-9S. Referans4. Yılmaz R, Karaaslan E, Özçetin M ve ark. Çocuklarda idrar yolları enfeksiyonu etkenleri ve antibiyotik duyarlılıkları. J Contemp Med 2012;2(1):17-21. Referans6. Guidelines on Infection Prevention and Control 2012. ESBLs HSE South (Cork & Kerry) Community and Disability Services. Sectıon 11.1 Extended- spectrum β-lactamases (ESBL) Page 2 of 4 http://www.hse.ie/eng/about/Who/healthwellbeing/Infectcont/Sth/gl/IPCCGuidelines Section11 1.pdf. Referans7. Mehrgan H, Rahbar M. Prevalence of extended-spectrum beta-lactamase-producing Escherichia coli in a tertiary care hospital in Tehran Iran . Int J Antimicrob Agents 2008;31:1471-51. DOI:10.1016/j.ijantimicag.2007.09.008. Referans8. Falagas ME, Vouloumanou EK, Togias AG et al. Fosfomycin versus other antibiotics for the treatment of cystitis: a meta-analysis of randomized controlled trials. J Antimicrob Chemother 2010;65:1862–77. doi: 10.1093/jac/dkq237. Referans9. Matthews PC, Barrett LK, Warren S et al. Oral fosfomycin for treatment of urinary tract infection: a retrospective cohort study. BMC Infect Dis 2016;16(1): 556. Referans10. Grabe M, Bartoletti R, Bjerklund-Johansen TE et al.. Guidelines on urological infections. European Association of Urology 2014. [(accessed on 13 July 2014)]. Available online: http://www.uroweb.org/gls/pdf/19%20Urological%20infections_LR.pdf. Referans11. Hooton TM. Clinical practice. Uncomplicated urinary tract infection. N Eng J Med 2012;366(11):1028-37. Referans12. Clinical and Laboratory Standards Institute. Performance standards for antimicrobial susceptibility testing. Twenty-fi rst Informational Supplement. CLSI Document M100-S21, 2011. CLSI, Wayne, PA. 5. Referans14. Livermore DM, Warner M, Mushtaq S, Doumith M, Zhang J, Woodfordet N. What remains against carbapenem-resistant Enterobacteriaceae? Evaluation of chloramphenicol, ciprofloxacin, colistin, fosfomycin, minocycline, nitrofurantoin, temocillin and tigecyclin. Int. J. Antimicrob Agents 2011;37(5):415–9. Referans15. Patel B, Patel K, Shetty A, Soman R, Rodrigues C. Fosfomycin Susceptibility in Urinary Tract Enterobacteriaceae. J Assoc Physicians India 2017;65(9):14-6. Referans16. Hendlin D, Stapley EO, Jackson M et al. Phosphonomycin, a new antibiotic produced by strains of Streptomyces. Science 1969;166:122–3. Referans17. Bergogne-Bérézin E, Muller-Serieys C, Joly-Guillou ML, Dronne N. Trometamol-fosfomycin (Monuril) bioavailability and food-drug interaction. Eur Urol. 1987;13(1):64-8. Referans18. Cassir N, Rolain JM, Brouqui P. A new strategy to fight antimicrobial resistance: the revival of old antibiotics. Front Microbiol 2014;20(5):551. Referans19. Bandow JE, Brotz H, Leichert LI, Labischinski H, Hecker M. Proteomic approach to understanding antibiotic action. Antimicrob Agents Chemother 2003;47(3):948-55. Referans20. Alpay Y, Yavuz MT, Aslan T, Büyükzengin B. Genişlemiş spektrumlu beta-laktamaz pozitif Escherichia coli ile oluşan komplike olmayan üriner sistem infeksiyonlarının tedavisinde oral antibiyotikler karbapenemlere alternatif olabilir mi? ANKEM 2017;31(3):85-91. Referans21. Sönmezer MÇ, Tülek N, Köksal E et al. Toplum Kökenli Üriner Sistem İnfeksiyonlarında Etken Olan Genişlemiş Spektrumlu Beta-Laktamaz Üreten Escherichia coli İzolatlarında Fosfomisin Trometamolün İn Vitro Etkinliği. FLORA. 2016; 21(4): 153-8. Referans22. Bollestad M, Vik I, Grude N, Blix HS, Brekke H, Lindbaek M. Bacteriology in uncomplicated urinary tract infections in Norwegian general practice from 2001–2015. BJGP Open. 2017; DOI: 10.3399/bjgpopen17X101145. Referans23. Fajfr M, Louda M, Paterova P, Ryskova L, Pacovsky J, Kosina J et al. The susceptibility to fosfomycin of Gram-negative bacteria isolates from urinary tract infection in the Czech Republic: data from a unicentric study. BMC urology 2017; 17(1): 33. Referans24. Córdoba G, Holm A, Hansen F, Hammerum AM, Bjerrum L. Prevalence of antimicrobial resistant Escherichia coli from patients with suspected urinary tract infection in primary care, Denmark. BMC Infect Dis 2017;17:670. Referans25. Coşkun MV, Uyanık MH, Ağan İ, Huslu H, Çelebi S. Hastanede yatan hastaların üriner sistem infeksiyonlarından izole edilen genişlemiş spektrumlu beta-laktamaz üreten Klebsiella pneumoniae ve Escherichia coli suşlarının fosfomisin ve nitrofurantoine duyarlılıklarının araştırılması. ANKEM 2016;30(2):37-41.